While tracking market changes and growth trends, Greenway determined that the residential demographics of northeast Tarrant County were expanding dramatically. 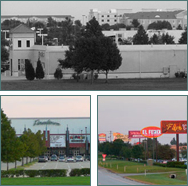 Knowing this growth was reaching the point where commercial and retail demands exceeded supply, Greenway moved decisively and took advantage of the opportunity to acquire 85 acres of land abutting D/FW International Airport and strategically located on Highway 114 in Grapevine, Texas. Greenway enhanced the investment by developing pad sites for a variety of local, regional and national tenants, capping our success when a major cinema chain also saw the property’s potential and purchased 16 acres to build a 90,000 SF movie theater.